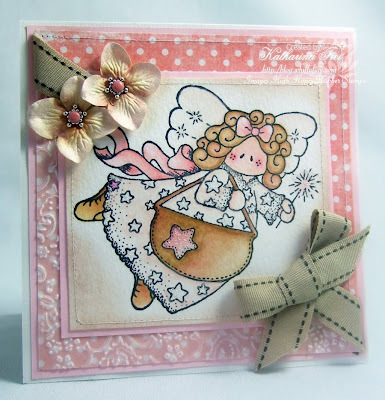 The charming and talented Kimmie is this weeks hostess at the High Hopes Blog and set the challenge to "dry embossing". 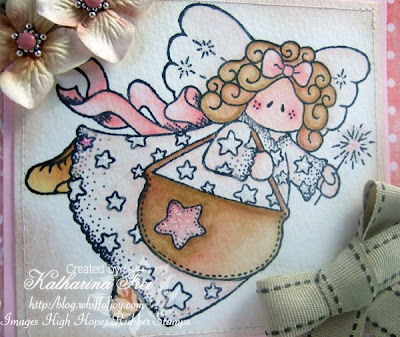 Die charmante und talentierte Kimmie ist diese Woche die Gastgeberin auf dem High Hopes Blog und setzte die Challenge "Trockenes Embossing". I used vellum with a cuttlebug embossing folder "textile texture". The dp from Bo Bunny still shines through which gives it a very soft look. The image is Candy, the tooth fairy from High Hopey Rubber Stamp, which can now be purchased as the January Potm set for 25% off. Ich habe Transparentpapier mit der Cuttlebug embossing Schablone "textile texture"verwendet. Das Motivpapier von Bo Bunny scheint noch etwas durch, womit es ein ganz zartes Aussehen erhält. Das Motiv ist Candy, die Zahnfee von High Hopes Rubber Stamps. Sie ist im Jänner teil eines speziellen Sets, dass man um 25% reduziert kaufen kann. I was in the mood for doing a sketch ;) Maybe you like to use it when you are in need for inspiration. Thanks for visiting and don't forget enter my Whiff of Joy Spring kit candy. Danke fürs Reinschaun und vergeßt nicht bei meinem Whiff of Joy Spring kit Candy mitzumachen. Fabulous card, I love it. I love the way you coloured the Toothfairy and what you did with the ribbon. Katharina what a BEAUTIFUL card! I so have to get this set for my mom...she's a dental assistant and would love this! die Karte sieht echt toll aus. Das Motiv kannte ich gar nicht, aber es ist super niedlich. Beautiful card, love everything about it. This is so precious! Love the vellum run thru the cuttlebug! Great sketch as you always do.. the book is coming right? Oh wow,schon wieder eine so wunderschöne Karte! Die Gestalltung und Farben gefallen mir sehr,sehr gut! Das Motiv ist auch sehr süß! Oh ist das ein süßes Kärtchen und ein wunderschöner Sketch.Den werde ich mir gleich mal abspeichern und bestimmt sehr bald nacharbeiten. Had fun using your sketch! Katharina this is gorgeous! 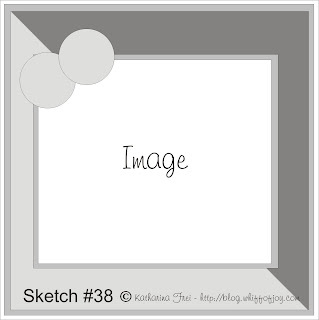 I love the embossing and the wonderful sketch. It's gorgeous Katharina, love the sweet colours, so perfect for this image and I like the one pink star.. So beautiful! I love your sketch, I was just thinking about your sketches today, I must note some down for when I am in need of one! This will definitely be one, great layout! Deine Karte gefällt mir supergut! Den Stempel könnte ich auch mal wieder nutzen! What a wonderful card - love the image and the colors you chose to build the card with. Great one again.